Below you can view all the homes for sale in the Saddle Rock Golf Club subdivision located in Aurora Colorado. Listings in Saddle Rock Golf Club are updated daily from data we receive from the Denver multiple listing service. To learn more about any of these homes or to receive custom notifications when a new property is listed for sale in Saddle Rock Golf Club, give us a call at 720-580-6694. Front Yard Maintenance Included In Hoa Dues! MLS#3392192. HomeSmart Realty Group of Colorado. Meticulously maintained by its original owners! MLS#6463077. RE/MAX Professionals. Full basement bedroom, bathroom and Custom wardrobe closet. 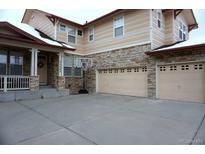 MLS#8544573. RE/MAX Alliance. This gem won't last long, book your showing today! MLS#9746077. Redefy. House featured in Furniture Row 2018 Save On Style commercial and 2019 catalog. MLS#3857695. COLDWELL BANKER RESIDENTIAL 24. Walk to tot lot & east pool w/ community featuring several parks, walking paths, pools & Southlands dining & shopping nearby. MLS#7325033. Realty One Group Premier. Dual furnaces & A/C's. A Must See! MLS#7646362. RE/MAX Professionals. But wait until you experience your private oasis with flagstone patios, raised garden beds, grape vine covered pergola, fruit trees & gorgeous perennials. Hurry to schedule a tour! MLS#3098630. COLDWELL BANKER RESIDENTIAL 24. Nook can be used for eating or cozy sitting area*Master Suite*Upstairs Loft +3 beds*Newly finished basement w workout room, entertainment and media rooms* Wine Cellar*Art Studio that could be Bedrm*Bath*Storage*Pool and Tennis Community*Award winning Cherry Creek Schools* Minutes to Regis High School*Minutes to C470, DIA, SOUTHLANDS MALL, PARKER ADVENTIST HOSPITAL MLS#4738870. RE/MAX Professionals. Full Unfinished Base. This is a MUST See... MLS#6420404. Berkshire Hathaway HomeServices Innovative RE.